I was home sick yesterday with a sore throat, achy body and a head so congested I thought it was going to explode. All I wanted was a bowl of hot, steaming Pho Ga (aka Chicken Pho) from Hoan Kiem, which I tried for the first time three weeks ago. It's days like these that I wish my superpower is the ability to make any food appear in front of me! Being sick and not having energy to get up and cook is no fun. By the way, do not boast that you haven't gotten sick all Winter season because it's inevitable that you'll jinx yourself and get sick! Hoan Kiem's Pho Ga has a very nice, savory chicken broth with a generous serving of rice noodles, slices of fresh dark and white meat chicken and if you want, they can add chicken gizzards and livers to your bowl. The soup is so delicious you'll want to drink all of it. 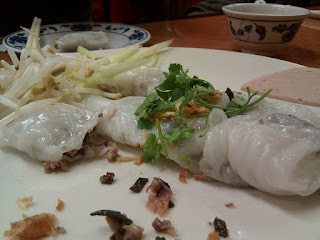 Hoan Kiem also has Banh Cuon. It's a sheet of rice noodle which is rolled with minced pork and "wood ear" mushrooms and you dip the roll in their special garlicky fish sauce. They make that fresh when you order it so the rice noodle is still slightly warm when its served. I love that. Hoan Kiem's specialty is their Pho Ga and Banh Cuon. These two things are pretty much the only things on the menu unless you count the Vietnamese Iced Coffee or you can get the chicken with rice but why would you do that?! Thanks so much for sharing your sick woman's craving! I've been searching for a place where I can have my first bowl of pho (I know, I'm a disgrace to food blogging! 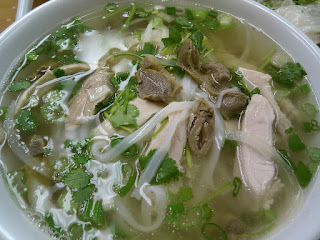 ), and this bowl of chicken pho looks like just the thing to ease me in! Hope you feel better soon!